In 2004 to go to the Olympics my pitching coach Pedro Perez suggested it. I wanted to be part of that team, which the council wanted me to pitch to left-handed hitters, this man of great experience told me that he had a Japanese pitcher who had little speed but pitched below the throwing arm. Also rather than step into the home, giving the crossover step when launching to take a step almost to first base, it would be awkward for lefties as the pitch would almost be behind the batter, and very difficult especially the slider. This arm angle has a great advantage, since all hitters are used to overhand. The baseball is always falling, rotating down. I had success with this arm angle because releasing the ball well from down under makes it difficult for both left and right-handed hitters, especially if it's on the outer corner of homeplate. 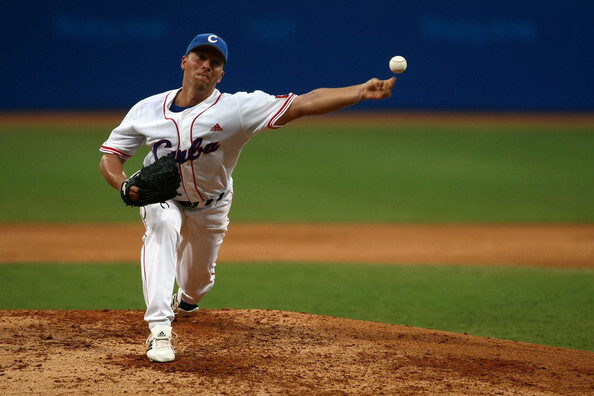 I would say to young pitchers always to throw over the top in the early years and then can gradually keep trying different ways to pitch and that's where this advantage of us pitchers, have several weapons to get hitters out. As for the mechanics of pitching this way I would give advice to pitch lots of flatgrounds. It will help get the feel of the release point out in front. For me, my favorite part is throwing to left-handed hitters mostly because it's my specialty, is what has led to my success, but against right-handed hitters I have a weapon that is in the outside corner for a tough hitter as they want to pull the ball. My favorite part of pitching down there was to go after the outer corner of the plate and then mix it up, come inside and get the thin part of the bat.